A few observations while marveling at the fact that a "Random Thursday" post is actually getting posted on a Thursday. We have to pay for our drinking water. My, how things change. Or not. Today is the last time I have to give my father-in-law a daily injection of post-surgery blood thinner. I'm going to suggest that, given the level of shot-giving expertise I've developed, we celebrate the occasion by me doing it blindfolded. I'll let you know how that goes. We were discussing grapefruit at dinner last night (yes, our conversations represent the pinnacle of human intellectual endeavor) and everyone shared their family's peculiarities when it comes to eating that fruit. Some opted for salt; others, sugar. My family fell into the latter category, although I don't recall that we ate a lot of grapefruit when I was a child. But I remarked that we probably went the sugar route because Ruby Red grapefruit probably hadn't been invented at that time, and so the grapefruit we ate was overly tart. Well, I was wrong about that; according to Wikipedia, the Ruby Red was patented in 1929, and despite what you think, I'm not that old. But I do wonder whether any Ruby Reds ever found their way to Evans Grocery in Fort Stockton in the late '50s/early '60s. And, finally, let's talk bicycles for a bit, shall we? 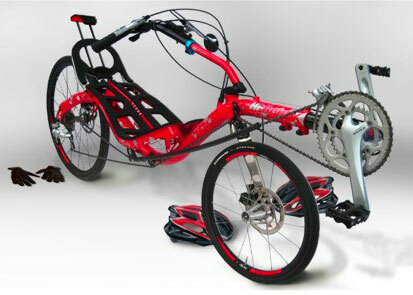 Below is a photo of what is by far the coolest recumbent I've seen in a while. It's manufactured by an Argentinian company called Hi-Bent and while its website doesn't have an English language option, it's easy enough to determine that the bike has an aluminum frame, front and rear disc brakes, and a unique front mono-fork. Cannondale has for years spec'd its Lefty mono-fork on its high-end mountain bikes, but I can't recall seeing this on a recumbent. The other thing that caught my eye is the unusual construction of the rear frame (go to the Gallery and scroll across to bring up the rear detail). It appears that there's no wheel dropouts; the rear axle skewer must be completely removed in order remove the wheel. This seems excessively complex and I don't understand the benefits, but it's certainly a different look. Eric, that bit about 'paying for water' reminds me of the water district initiatives on local ballots ... well, one ballot, at least. The outcome of balloting on said initiatives has been my favorite headline from Tuesday night ... even beating out the story of the California State Senator who won re-election two weeks after she died. Jeff, I agree that it would be hard to script a more interesting story than the way the machinations to get that water district in place have gone awry. I'd find it hilarious except for the significant amount of taxpayer money that will be spent to get the thing straightened out. The bike is pretty cool looking, but having to remove the entire skewer to get the rear wheel off would be a deal breaker for me. I get far too many rear flats for that kind of foolishness, no matter how interesting it makes the bike look. Yeah, there must be some universal law that says the likelihood of getting a flat on your bike's rear tire is directly proportional to the number of times each year that the sun rises in the east. This page contains a single entry by Eric published on November 4, 2010 9:04 AM. The Sci-Fi World of Insects was the previous entry in this blog. Local Oil and Gas Committee Meets Expectations...Unfortunately is the next entry in this blog.